Scaphoid fractures are a relatively common injury from falls or athletics. 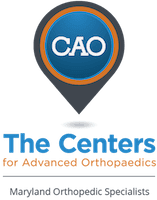 They are treated by Dr. Peter G. Fitzgibbons, MD at The Centers for Advanced Orthopaedics: Maryland Orthopedic Specialists Division, who is fellowship-trained in both orthopaedic trauma and hand surgery, and is uniquely qualified to care for these injuries. With locations in both Germantown and Bethesda, Maryland, he and a team of orthopaedists, hand therapists, and physical therapists offer a comprehensive range of services covering the diagnosis, treatment, and recovery from scaphoid fractures. What exactly is the scaphoid and why is it important? The scaphoid is a small bone in the wrist that plays a key role in the mechanics of the wrist. It is the most common of the wrist bones to sustain a fracture. The scaphoid has a naturally poor blood supply which makes it particularly prone to either slow healing or not healing at all (nonunion). How are scaphoid fractures treated? If a scaphoid fracture is nondisplaced, meaning the bone broke but the two pieces did not shift, then it can heal with immobilization, usually a cast. This can take longer than with other fractures, sometimes up to three months or more. When the fracture is displaced, or when prolonged immobilization is a problem, surgery may be recommended. What is surgery for a scaphoid fracture like? Surgery for a scaphoid fracture is an outpatient procedure done with general anesthesia. Usually, a small incision is made and a screw is placed across the fracture to hold the two pieces of the bone together. In some cases, a bone graft is used to enhance healing potential. The wrist is usually immobilized for at least 4 weeks, and sometimes longer depending on the nature of the fracture. Dr. Fitzgibbons performs most of these procedures at the Massachusetts Avenue Surgery Center, an outpatient surgery center that provides a safe, patient-oriented experience in a friendly and comfortable environment.